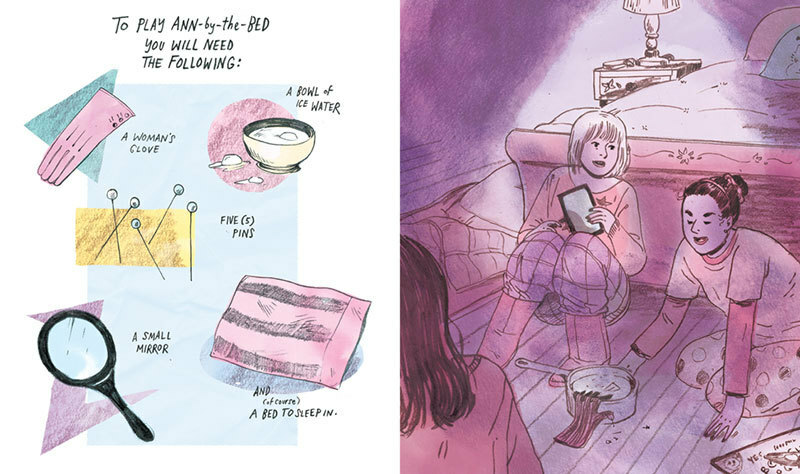 Emily Carroll’s ‘Ann By the Bed’ is all of these things but I’m going to attempt to get through an entire review of the acclaimed artist’s work today without falling back on any of those standard adjectives that are so readily associated with her stories. This latest supernaturally charged offering comes to us as part of Youth in Decline’s Frontier series, a quarterly monograph-style publication giving individual comics creators a showcase opportunity for their work. Previous issues have included material from the likes of Sascha Hommer and Ping Zhu, with 2015’s schedule set to present comics from Jillian Tamaki , Anna Deflorian, Becca Tobin and Michael DeForge. I’m sure we can all agree that’s an amazing line-up of talent. 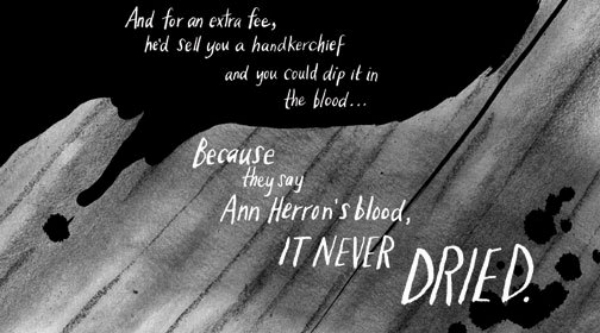 The pivotal events of ‘Ann By the Bed’ occur in the year 1934 when Ann Herron was brutally murdered in the family home by an unknown axe-wielding killer. All of Ann’s immediate family had died tragic, violent deaths in the years prior to this, with one exception – her sister Jennie who had married her sweetheart Henry Strahan just three months beforehand. After the killing, rumours in the vicinity were abundant, with suspicion falling on everyone from Jennie to Robert, and even Ann’s own alleged involvement in Satanism being put forward as a potential reason for the slaughter. But the person responsible was never caught. 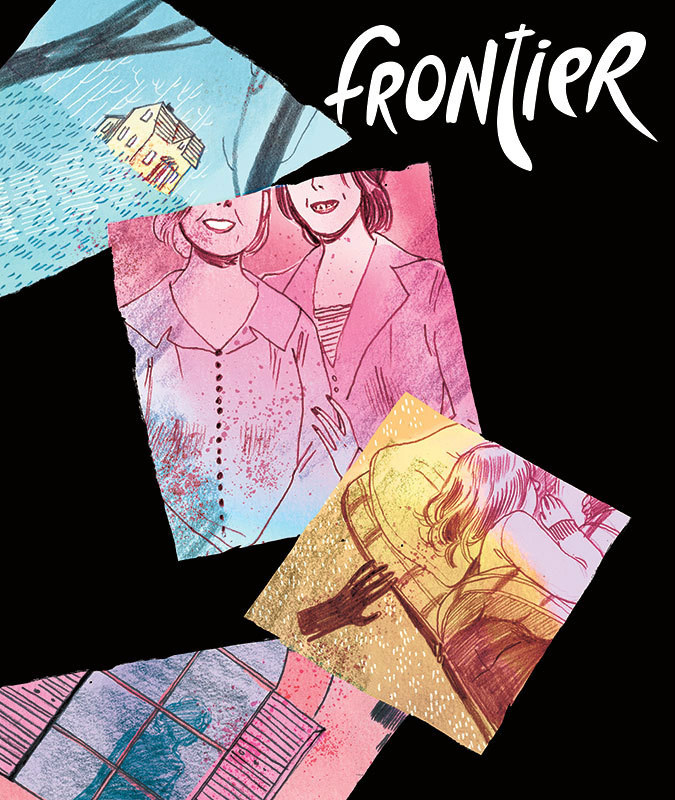 Readers only familiar with Carroll’s work via last year’s well-received collection Through the Woods will find her taking an intriguingly different narrative approach to her particular brand of fiendishness in Frontier #6. Unlike the stylised fairy tales and Gothic horror of that compilation, ‘Ann By the Bed’ adopts a deliberately disjointed presentational style. Sequential art here combines with historical artefacts – photo albums, house plans, movie posters – and constant chronological jumps back and forth to create a jumbled account of Ann Herron’s life, and the possible supernatural aspects of her afterlife. 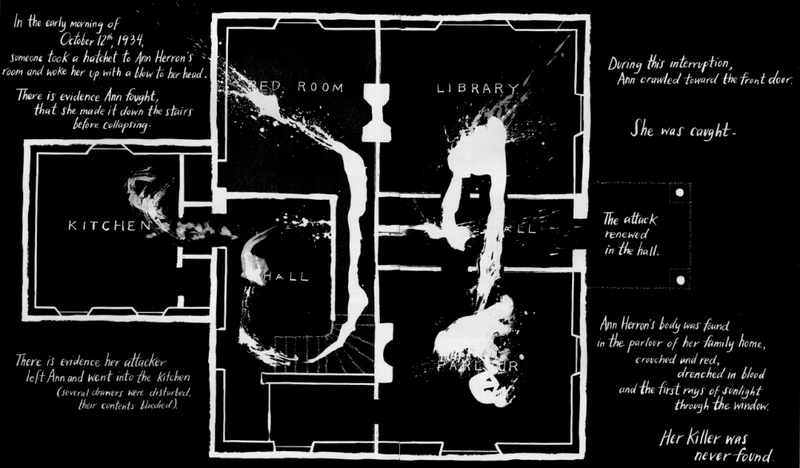 It’s a subtly clever piece of audience manipulation ensuring by its rapid changes of tone, colouring, scene and pace that the reader is in a constant state of unease and agitation – able to grasp at just fragments of the truth at the heart of this tale, with any possible coherent bigger picture always elusive and slightly ethereal. The sense that the entire story is being told from a detached perspective, or from brief “witness” accounts, with no true protagonist as such for the audience to identify with adds an extra layer of discomfort to the preternatural proceedings herein. Indeed, constantly disarming the reader with contradictory hints and insinuations about events and characters is a ploy that Carroll uses with merciless glee. 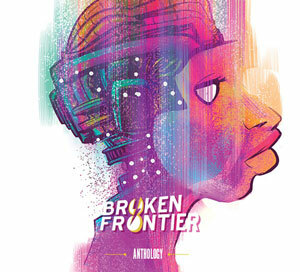 The themes of Frontier #6 can also be interpreted as social commentary on the exploitation the infamous and the horrific to entertain and amuse. Ann’s vicious killing becoming, in time, both the casual subject of pop cultural ephemera and the throwaway scary story behind a children’s game. As an object lesson in how to ramp up tension and foster a sense of brooding otherworldliness, ‘Ann By the Bed’ is a tour de force of visual technique. Carroll’s use of deep blacks oozing across the pages is a recurring and menacing motif whether it be in the form of indelible stains, shadowy figures, sinister silhouettes, vandalised photos or ominous landscapes. The frequent skewed placement of characters’ profiles and fractured or overwritten panels also serves to underline that impression of disconnection that makes Frontier #6 such an eerie journey into the unknown. With its scrapbook feel of multiple sources being collated together, the convergence of morbid but innocent curiosity and the supernatural, and an understated but gut-wrenching conclusion that is positively threatening in implication and delivery, ‘Ann by the Bed’ is undoubtedly Carroll’s creepiest comic to date. 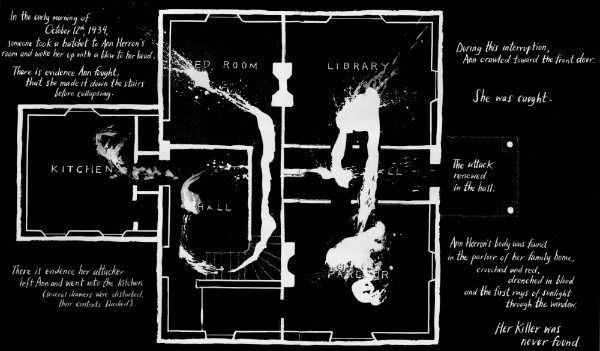 While its central conceit – the idea of childish game-playing unleashing malevolent forces – is an oft explored one in horror fiction the triumph of ‘Ann By the Bed’ is in the presentational execution of that premise. While I attempted to avoid the obvious labels for Carroll’s storytelling in this review every one of those nine words at the beginning of this piece applies to Frontier #6. This is a comic which is not just a testament to the macabre imagination of Emily Carroll but also an excellent introductory point for anyone wanting to investigate the burgeoning indie goodness of the Youth in Decline back catalogue. Keep an eye on the San Francisco-based outfit in 2015 because they are fast becoming one of the most important players on the independent comics micropublishing scene. For more on the work of Emily Carroll visit her site here. You can buy Frontier #6 from Youth in Decline via their online store here priced $8.00.